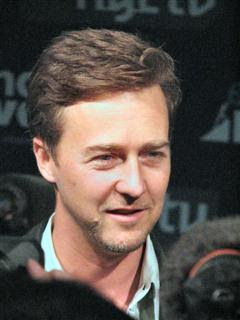 I remember a few months back a regular reader of the HughE Blog requested an Ed Norton picture. 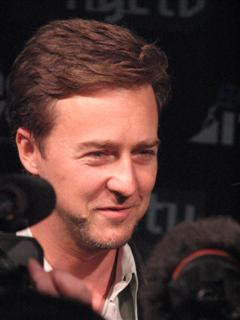 I search and search for an Ed Norton event and finally found one, he was not very cooperative (the rumors were true - he is a DIVA). His luck ran out as I attended the Gotham Awards at Pier SIXTY last week and he was a sitting target (standing actually). Pier Sixty, who knew, easy to gawk at celebrities as they made their way up the "Red Carpet", especially if you are somewhat well behaved. By this time every security personnel knows me, I am respectful of their job and when they ask me to move or not stand too close to the press line, I obey. Then they give me leeway in other areas, like departures. Anyway Ed was getting interviewed and I took out my long lense and capture a few shots. It's a good thing too, as he made his way to the paparazzi part of the press line, he posed and then moved swiftly from their line of sight. First up - Access Hollywood, ET and the Inside Edition video interviews (rt - Tim Robbins, Lft Ed Norton) (Without flash shot) (With flash shot) Looks like Ed lost his battle with a razor as shown in this picture (see near chin - ewww) Guess Ed doesn't believe in cover-up make-up. I think he needs a good women in his life to advise him. Ed as he swiftly moves away from the "Red Carpet" and photographers...everyone got lots of nice profile pixs Have a happy Ed Norton day. i LOVE ed norton. he's one of my favorite actors. awesome hughE! Oh he is so boyishly handsome! He makes me sssswooooooon! Thanks for the close up of those lips. Whew. Forgot to say, yep, I think 'Children of Men' is coming out on DVD soon. I saw it at the cinema a few months ago here in London and the movie premiere pics are on my blog. God, Clive Owen's gorgeous! I could email you, but I'm being lazy, also, I believe you owe me 2 or 3! Ed is hot, painted veil was decent. I'm the regular who asked for Edward pictures..thanks so much for getting two events of him!! I know you're not a fan but I love him. Maybe I could be the woman to guide him to perfection! well I can always dreams.